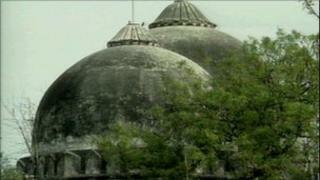 The Supreme Court of India has delayed a ruling expected on Friday on the long-running Ayodhya dispute. It deferred until next week a ruling due from the Allahabad High Court in order to give Hindus and Muslims more time to resolve the 150-year dispute. "The court felt a last attempt should be made to resolve this amicably," lawyer Mukul Rohatgi said. The High Court is to set to rule on who owns land where a 16th Century mosque was destroyed by Hindu mobs in 1992. Hindus claim the site in the northern state of Uttar Pradesh is the birthplace of their god, Lord Ram. The destruction of the mosque led to widespread rioting between Hindus and Muslims and some 2,000 people died. It was some of the worst Hindu-Muslim violence since the partition of India in 1947. The High Court was to have ruled on Friday on whether the site should be given to the Hindu community to build a temple or returned to the Muslim community to rebuild the 16th-Century Babri Mosque. India's home ministry has already warned that the legal decision is likely to evoke sharp reactions and communal passions. The Uttar Pradesh state government has deployed thousands of extra security forces to deal with any law and order problems.